As a “baby” Baby Boomer, my childhood memories are not the bucolic “Leave It to Beaver” 1950s. But the summers of the early 60s weren’t far off the mark in my upstate New York home. Joys were found in fireflies and dragonflies and bonfires by the lakeshore. We feasted on corn on the cob roasted in hot coals, and played kickball while our parents drank beer, threw horseshoes and laughed with our aunts, uncles and neighbors. Then we grew up and watched the world become so much more complicated. We went from being hippies to yuppies to workaholics, dizzy with success (or at least the pursuit of it). We were sucked into the crazy excesses of the 1990’s and frankly, we forgot to have fun. Our children were driven from school to soccer to cheerleading to baseball to karate to dance to bed in a maddening cycle of tightly organized “playing”. Fun became something to be planned and coordinated and scheduled. The century turned, and terrorism introduced itself to us in earnest. The economy sank again. Talking heads worked to convince us that we are a divided country – red vs. blue, patriot vs. immigrant, liberal vs. conservative, with no hope of compromise. You might assume the charming Americana of our childhoods has been lost to our own cynicism. But your assumption would be wrong. Our essential American character is alive and well. I saw it in action over the past holiday weekend, spent in a southern coastal town. I suspect it was occurring in other scattered towns and neighborhoods across the country. Saturday evening was spent in lawn chairs in the town’s waterfront park, listening to quality live music performed in the modern yet charming pavilion. The sunlight splashed through the trees across the people gathered there. Sitting in a variety of portable chairs, or seated on blankets on the grass. Young adults were standing in small groups, laughing and dancing in the sea-scented breeze. Children ran and played across the park. Babies giggled with their relaxed and smiling parents. Seniors tapped their toes to the music and chatted over ice-cold lemonade. My husband and I shared a hot funnel cake buried in drifts of powdered sugar and cinnamon. As Motown melodies filled the air, I sighed and said “This is perfect.” And it was. That perfection carried over to Sunday – the Fourth of July. First was a church service filled with patriotic music, a powerful homily delivered by an Afghanistan veteran, and an interpretive dance performed by a young man from Haiti. The afternoon revolved around the annual neighborhood picnic. As I headed down the road in our pick-up truck to gather tables from the church, neighbors called out and strong guys jumped in to help. People were scurrying back and forth between houses, with chicken grilling at one, hot dogs cooking at another, and the tents and chairs set up at a third. Everyone arrived on schedule with food – good old-fashioned coleslaw, pasta salad, baked beans, brownies, pies, cakes. Laughter and hugs. Old friends introducing themselves to new neighbors. The kids (young and old) played volleyball. And as the sun began to set, chairs were arranged in a driveway so that we could re-gather under the stars to watch a movie projected on a sheet duct-taped to the garage door. Movie popcorn and candy were served, while we laughed and cuddled. It was perfect. Monday didn’t disappoint. We joined friends on their boat on a sultry afternoon, dropped anchor off a private sandy jetty, and feasted on sandwiches and sangria in the warm sun, listening to great music and enjoying catching up on our busy lives. Perfect. Three days without televisions or radios to tell us all about the latest scary predictions or tragedies. Just good friends and sunshine. And the best part? Well, for one thing, it was basically free. A funnel cake at the concert, and our food contributions to the picnic and boating lunch, and that was pretty much it. It was a long way from being some upscale spa resort weekend. But even more special than being inexpensive was that the entire hot southern weekend was true Americana – celebrated by people of different ages, different races, different religions, and vastly different political beliefs. All those differences were set aside to celebrate America’s birthday and each other. Our childhood summers are more than just sweet memories – they can still be experienced today. The challenge is to figure out how to carve out some of that perfection in the days, weeks, months to come. A little less television. A little less “organizing”. A little less tension. Less worry. A little more appreciation of each other. A little more laughter. More spontaneity. A moment taken in our oh-so-busy lives to catch our breath. A little more focus on the quiet blessings that surround us. If there’s one thing we Baby Boomers have learned, it is that life runs in cycles – what goes up must come down and (usually) what goes down can bounce back up again. Political parties gain and lose power. The economy surges and recedes. Military tensions flare up and diminish. That’s why they call it a “news cycle”, after all. So let’s try to relax and remember the joys of our childhood, and give our own children the chance to experience low-pressure old-fashioned summer fun. 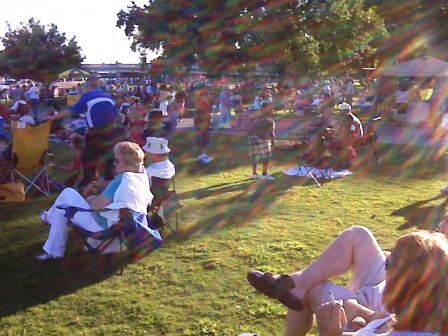 Concerts in the park. Picnics and sparklers. Boat rides and beach visits. Americana revisited. It’s perfect.